As XPAs first rose to prominence in Australia, you'd find almost as many interpretations as to what they should be as you would actual beers bearing the tag. Over time, however, the majority seem to have settled into a rhythm: pale yellow/gold in colour and with the hops utilised to deliver plenty of aromatics with bitterness and malt character kept to a minimum. 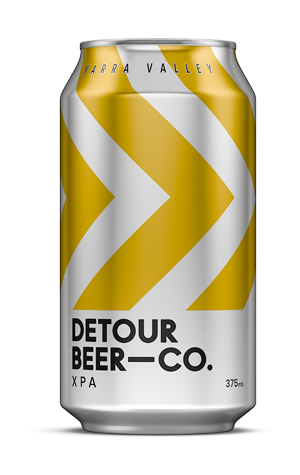 The XPA in Detour's launch quartet is a little different, however. For one, head brewer Glenn Harrison says he set out deliberately to avoid using the hop varieties favoured by most of his XPA-brewing peers – the likes of Mosaic – instead landing upon Calypso and Denali. It's a little darker in colour too, with an attendant malt sweetness at play thanks to the use of Vienna and Crystal malts. The hops – all added late on – serve up pineapple, pine and a deep citrus character on the one hand, an earthy bitterness on the other, the result of which is a beer with more in common with the pale ales of a few years back before we all embarked on a tropical vacation.